Home » current-affairs » From Out of Nowhere: Bam! Nibiru! From Out of Nowhere: Bam! Nibiru! 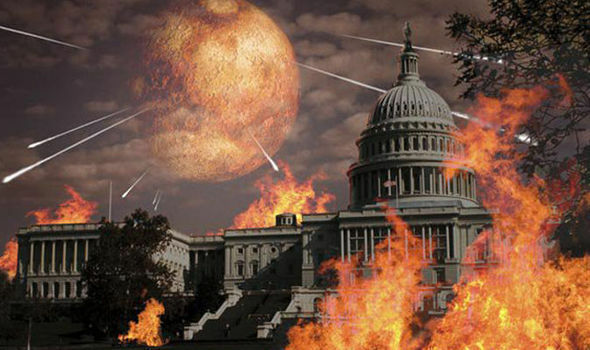 For feeble-minded Christians, especially those who believe in all the cockamamie conspiracies that are “revealed” by self-proclaimed prophets, Earth can possibly be destroyed this coming Saturday by a roving hidden planet that no one has seen yet. That planet has variously been called Nibiru and Planet X (among other things). That’s the prediction of David Meade, a self-published author whose subject matter is astrology and the Bible. How can such a planet, supposedly larger than the Earth, be at one and the same time invisible and moving very, very fast? This whole Nibiru/Planet X catastrophe has been predicted several times before. Even Meade originally set the date in October, but revised his prediction because of the recent eclipse. I would have thought he would base his prediction on that well-known Beast of the Apocalypse, Donald J. Trumpf—but no. Sometimes I think these Christian conspiracy theorists have altogether too much time on their hands. My suggestion is that, on Sunday, September 24, the survivors of the Nibiru disaster gather together to mock David Meade and his kind. You can do so by contacting him at DavidMeade7777@gmail.com—if, that is, he doesn’t close that e-mail account beforehand. This entry was posted in current-affairs and tagged apocalypse, christianity, david-meade, nibiru. Bookmark the permalink.